I only learnt to swim in my late 20’s because I had a terrible fear of water and being out of my depth. This was from when I was 7. My first swimming experience was not a good one. I remember being in the pool with my school class and we bounced around doing “ring, a ring, a roses” when it came to the bit “we all fall down”,we went under water, but I didn’t come back up and had to be fished out. Writing that, I can remember the feeling of the utter terror thinking I was going to drown. I had a similar experience when I was a teenager, if you couldn’t swim in school PE lessons, you were left to flail in the shallow end with a float. One of my PE teachers said at the end of the class “everyone is to go down the slide”. I froze with terror. The deep end was over 6ft and I couldn’t swim. I tried to protest but the teacher said “without exception everyone is to go down the slide”. So I did and ended up being fished out again and was scared to death of the water and being out of my depth since that day. I would hope that these barbaric things don’t still happen at school anymore. One New Year in my late 20’s I decided to learn to swim as a New Year’s resolution. The local leisure centre did a 7 week course for the absolutely terrified. I remember having 2 armbands on each arm and floats. Each week losing air in the armbands, taking one off until I was able to swim a width unaided. I burst into tears at my achievement. After I had learnt to swim, friends came with me to help me tackle doing a length of the pool. I did that but panicked as soon as I couldn’t stand up. I would swim lengths, even managed a mile but always in the back of my head was that fear. On various holidays, my 2 stepsons would try and help me. Both of them holding my hand and saying just put your head under water and you will be ok. But after getting my chin in, I would panic and not go any further. I would feel pangs of jealousy seeing friends, family jumping off boats into the sea with no cares, or doing open water swimming in the lake. So that’s why this made it onto my list. If I could face my fear I could swim in the Lake. I’ve been going to the Body Rehab in Staveley for over 3 years. 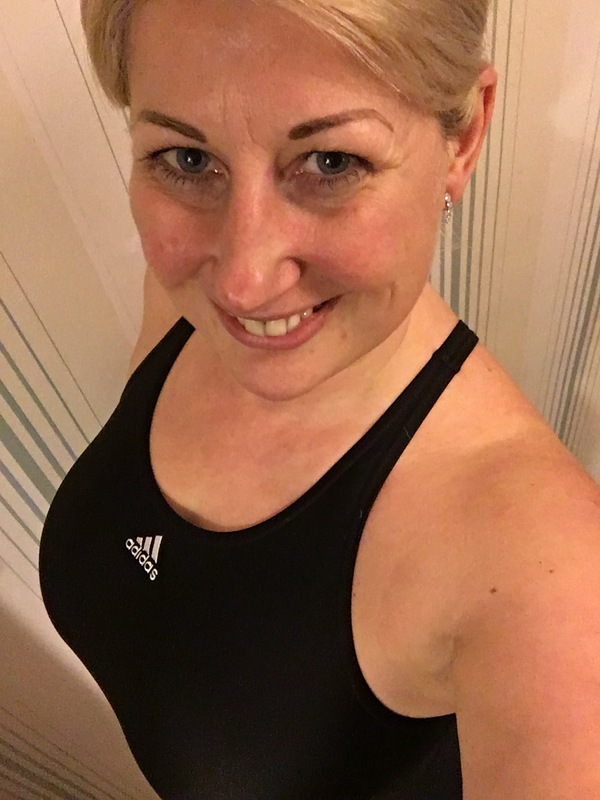 Sue who inflicts sports massages on me has become a friend (as have all the rest of the team), when chatting she said she was coming up 50 and took inspiration from my list and had various things she wanted to do. There were a couple of things I could help her out with. She asked about my fabulist and I told her about my fear of being out my depth. She said I can help you with this. Sue is an amazing swimmer, having swum the length of Windermere and is an incredibly competent swimmer. I trust her implicitly so who better to help me. So after several failed attempts to coincide our diaries, we finally managed to get a date to start. I was so apprehensive, it’s not as if I can’t swim but the thought of doing this scared me. Into the pool, Sue’s calming words made me feel a bit more calm. In the shallow end and she asked me to go under water. I felt panic surge and could only go under up to my nose. We carried on just trying a little more dunking. It felt less scary when I borrowed Sue’s goggles. Hold onto the side and float. Now you’d think with having an ample chest, these would act as a floatation device. Urmmn wrong, I kept sinking! Relax more is the key and this will come over the next few weeks. Can you tread water? Think so came the reply. I Practiced in the water where I could stand up and yes I can tread water. Now to practice gliding. A couple of lengths done putting this into practice. When I swim breast stroke I was swimming with my head above the water. Sue directed me to put my head more into the water, instantly I felt like I was swimming more efficiently. So what we are going to do next is swim to the deep end, tread water for 30 seconds and then glide off not touching the edge. Internally I was panicking but tried to relax. Got to the deep end and tread water. Sue talking to me to distract me, come on time pass quicker. Turns out I treaded water for a minute. Smiling at this achievement as I swam back to the shallow end. Last test before getting out, dunking my head under water. Buoyed with confidence, 1 2 3 hold my nose and managed to get my entire head under the water. Only for a second or two but I did it. So chuffed with myself. Still a long way to go, but feeling better. As Sue says you have to respect the water. A huge thank you to Sue for helping me on this journey. The Plan is to swim the width of Windermere in the summer. I can relate to some of those early experiences. At primary school we had swimming lessons and if you didn’t take to it naturally, you got labelled as a “non-swimmer”, put in the small shallow pool with a float and basically mocked. Because we were divided into two camps and the places were allocated accordingly, I actually had less chance of getting picked to go swimming, so found myself left in the classroom doing extra work more often instead. Which obviously helps no end. I had a similar experience as a teenager: left to wallow in the shallow end of the coldest water I’ve ever been in, then told to swim a width in the deep end right at the end of the lesson – everyone must do it, no exceptions. I made about 3 strokes. I learned eventually – we had a small pool at home and I eventually swum a length, earning myself £25 for achieving it. Even to this day, swimming’s not something I enjoy doing, I won’t put my head under, and it’s very much something I am reserving for when I’m on a sinking ship.